A fun, no-frills multi-week race series scored in two segments and run from Stellos Stadium along the scenic trails of Mine Falls Park in Nashua, New Hampshire. Choose from 5K & 5-mile distances. Both start at 6:30pm on Monday nights starting the first Monday of June through mid-August. A“relay” race will take place on Week 6 and a “PR” race will take place on Week 12. Rain or shine. Overall winner scores 100 points. All other finishers score on a percentage basis of the winner's time divided by their time. Age-group awards to top male and female for each of the two series segments in the following age divisions: 14 & Under; 15-18; 19-39; 40-49; 50-59; 60-69; and 70+. Special awards to overall top male and female of the entire series. Receive a commemorative Summer Trail Series long sleeve t-shirt by participating in all 10 scoring races (not including the relay and PR race). 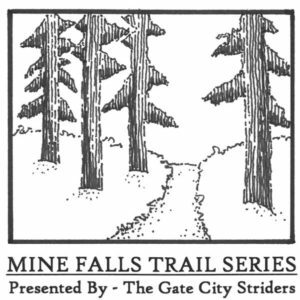 The course is run entirely on trails through Mine Falls. The terrain for the 5K is mostly flat, wide & well groomed. The footing is rugged but safe, over rocks, roots and packed dirt. The 5-mile race utilizes some of the lesser-used trails in the park, through winding single-track and rolling riverside paths. The trails are well-marked with chalk arrows and volunteers directing racers at major trail intersections. You can complete the Trail Series Race Application in advance or register on site for one race or the entire series. Take exit 5W off the Everett Turnpike (Route 3) in Nashua. Turn right at the first set of lights after the Police Station. The entrance to Stellos Stadium is the first left. Mine Falls Park is a 325-acre park in the city of Nashua, New Hampshire. Located in the heart of the city, it was purchased in 1969 from the Nashua, New Hampshire Foundation with city and federal Land and Water Conservation Fund (LWCF) money. It is bordered on the north by the Nashua River and on the south by the millpond and power canal system.